Lou Markle, like two other 1984 inductees, grew up in Smithville. In fact, he attended high school with Steve Baughman. Jane Plank Buch came along a bit later. He was born into a family where sports commanded a high priority. His father, Everett, was Mr. Baseball around the community for years, both as a player and manager of the then popular town teams. Lou played basketball and baseball for Wilbur Berkey, one of the most beloved of Wayne County coaches. He teamed with Carl Brubaker, Marvin Brucck, Ken Beaverson and Bill Gerber to carry the Smithie colors to the Kent regional in the late 1940’s. Baughman was the sixth man on that squad. Berkey termed it his best team of all; despite the fact that only one player was a six-footer. Markle was also good enough on the diamond to receive an athletic scholarship from Michigan State. The latter was terminated when a toboggan accident cracked several vertebrae in his lumbar region. Lou was in a body cast for months, but was sufficiently healed by the next fall to heed brother-in-law Wes Peterman’s plea to join him at Ashland College. His back healed, Lou saw action in both basketball and baseball for the Eagles. He was good, but not great as a cager. On the diamond his career suddenly blossomed. Playing first base, he compiled a .433 lifetime batting average, which is still number one among all who have worn Ashland colors. Following graduation, he signed with the St, Louis Cardinals for the 1952 season. He played for New Iberia in the Evangeline League where he was runner-up to Bob Troyer of nearby Walnut Creek for Rookie of the Year. Then came two years in the U. S. Army where he was assigned to the M.P.’s, but actually played ball, one year in the States and another in Europe. He returned to minor league warfare for two more years, bowing out with a .309 batting average for Decatur, which the Cards did not deem worthy of advancement. 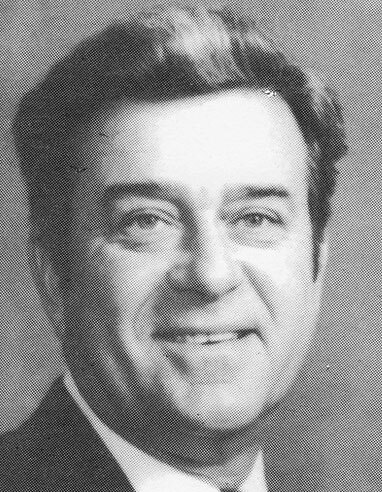 He became a teacher and coach at Wadsworth and Dalton before joining his alma mater in 1966 as assistant coach in both baseball and basketball. He continued his baseball career in Akron’s fast semi-pro league and earned a Master’s Degree at Kent State. Lou took over the head baseball job at Ashland in 972 where he has seen five of his players, led by southpaw Ken Kravec, enter professional ball. He has also served as a staff instructor at summer baseball camps and is a popular speaker at winter clinics. He and wife Shirley are the parents of two sons, Doug and Kevin, both students at Ashland College. As a freshman at Michigan State, Lou Markle thought that a broken back had terminated his athletic career. Instead, it was only a temporary detour en route to the Wayne County Sports Hall of Fame.